Sunday September 25th 1881 We went to church this morning and I went to Bakers for dinner where I spent a pleasant afternoon. Will called for me about four oclock and we rode till six. In the evening went to the Methodist church to the memorial services. 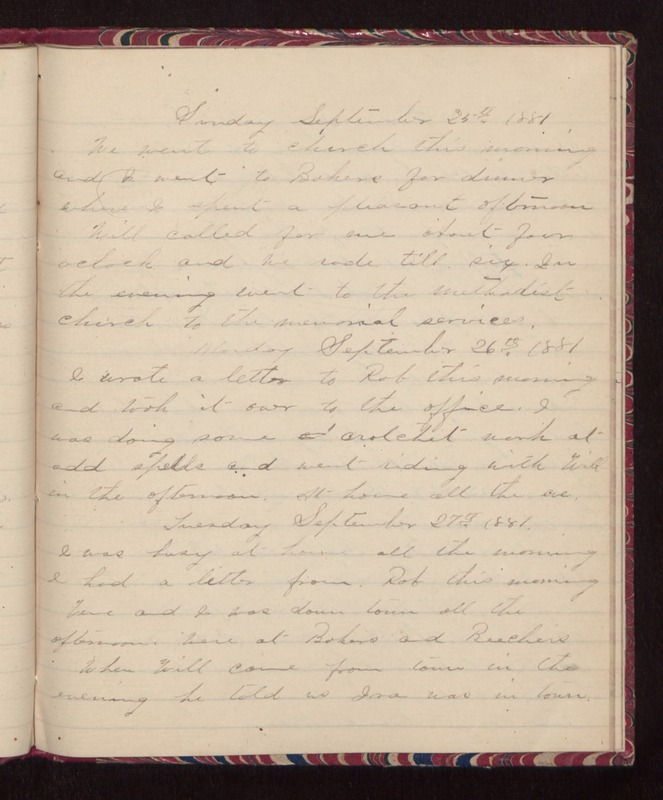 Monday September 26th 1881 I wrote a letter to Rob this morning and took it over to the office. I was doing some crotchet work at odd spells and went riding with Will in the afternoon. At home all the eve. Tuesday September 27th 1881. I was busy at home all the morning. I had a letter from Rob this morning. Vene and I was down town all the afternoon. Were at Bakers and Beechers. When Will came from town in the evening he told us Ira was in town.